This guide deals with TOP-13 best survival gear that will be helpful during camping, hiking, backpacking, and similar activities. You will learn what multi-tool kit is considered to be the most functional, what backpack is suggested for children and how you can quickly warm your hands under cold weather conditions. By the way, if you have a friend who is a passionate hiker and you are troubling your head about what kind of gift would be suitable for him or her, these product picks will be a real lifeline for you! The guide also covers a filter removing bacteria and parasites from the water as well as such indispensable items as a fire starter and a super sharp knife. A very tough and lightweight tent as well as dual-side and heat-retaining blanket are definitely must-have items for those who are going to spend the night in the open air. Of course, you will not do without a flashlight that can be either battery-run or solar-powered. A waterproof USB-charger and a solar cooker are the items that will bring civilization to the most remote places in the world. For as long as I can remember, I have been an avid hiker, camper, backpacker, bushcrafter, and an overall outdoor survival nut. When I go out into the wilderness for longer than a day, I always try to pack everything I need. If you are like me, then you probably have also forgotten that one thing that can make any outside trip a “walk in the park”, pun intended, or a nightmare through the forest. 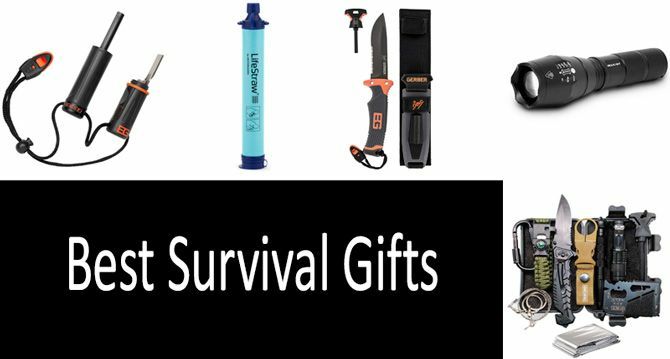 Luckily, I recently started looking for some new equipment and just had to share my thoughts on all of this survival gear. Before this, I use to have a multitool that looked almost identical, but much less stylish. Yeah, style isn't everything, but it does feel nice when your buddies comment on how nice it looks when you whip it out to open a bottle by the fireplace. So far, it is still staying strong and sturdy after a dozen or more uses every trip. The pliers have a really tight grip, the wire cutters are super sharp, and the double-toothed wood saw is still super sharp after using it for over 10 hours of time total. I give this multitool a solid recommendation based on functionality alone. Note: this is one of the more expensive multitools, but personally, it is entirely worth it because of how durable it is and how long it will last. I was a little hesitant about buying this kit at first since I already had a decent amount of gear already. That, and I saw that it was not really that popular, probably on account of the price. Even then, I went out on a limb and got the kit to see what it was like. Unfortunately, each item in the kit was hit or miss. The backpack was nice and sturdy, but the straps were lower quality than my used backpack. Besides the shovel and flashlight, everything else was pretty decent. I particularly liked the compass and how fluid the needle was. The flashlight and shovel were much cheaper quality-wise than my old gear, both being easily broken by using them. In the end, I wouldn't recommend this kit for experienced outdoorsy types. There are much nicer ones out there for around the same price or a little more. It could be used as a good kit for a kid, without the sharp tools, or a teenage boy/girl scout. I am not exaggerating when I say that these hand warmers were the saving grace of many of my trips. I could not tell you how many times the weather was my enemy, especially when I was trying to sleep and could not get because of how windy or cold it was. The box says that they last up to 10 hours, but when I used them, it felt more like 2 to 6, depending on how cold I actually was and how fast the wind was blowing. I usually stuff them in my pants pockets and jacket pocket while I am hiking, when it gets cold in my tent, and often when I go hunting or fishing. A huge bonus is how small and lightweight they are, not making my pack too heavy and they can be easily thrown away in a trash can. There are very highly recommended. I have been using them for years and until they come up with ones that last even longer, I will probably not stop using them. Besides, I have chosen this model as a gift for my girlfriend as it is both practical and symbolic. Unlike the other kit which I was hesitant to buy, I was actually really excited for this kit. Most of the tools like the flashlight, compass, and knife looked almost identical to some of my gear that I had years ago, making me want to get it even more. Sadly, they were not the same quality as the old gear. The compass was very cheap, often getting stuck and breaking within a few weeks. The knife and flashlight were pretty durable, but the knife was not sharp at all and the flashlight dies pretty quickly. Note: I have used several different battery brands. Fortunately, the fire starter works really well and worked the first time like a charm, and I use it every once in a while, never failing to start a campfire. Since it isn't that expensive, I would recommend this as a back-up kit or another kit for kids but minus the dangerous equipment. I first learned about these water filters several years ago and was instantly drawn to them. I thought that it would be perfect for a true survival scenario, which I had the unfortunate fate of happening to me several years before that. These can last for years and supply over 1,000 gallons of clean drinking water in its lifetime. It removes over 99 percent of all bacteria and parasites from any water that is pulled through it. After I learned that it was approved by several countries as a proper water filter, I bought one for myself and have tried it out but really only needed it once when I was on a hike and ran out of water before I could make it down the mountain. I used it in a small stream which helped to hold me over until I got back to my car the next morning. There is a little bit of a taste to the water, but it is all still completely drinkable. I would recommend this product to anyone who wants access to clean water wherever they go. They come in a variety of packs and when you buy one, the company donates one to a child in need. Remember how I said earlier that I usually use a different fire starter than the one in the TRSCIND's kit? Well, this is the one that is possibly my most favorite out of all of the past ones I used. This is possibly one of the most affordable fire starts that also have an emergency whistle and a strong cord that is very durable. What is really nice about it is that it is stored in a waterproof compartment that is the handle of each of it, both being connected to each other all of the time by the cord. It also comes with a small survival sheet that the user can reference if they need to. For the quality of the mini bundle and also given the price of it, I would definitely recommend it. I have started many a campfire and bonfire very quickly with this little tool. With the item being so reliable, I bought it as a gift for my brother — I knew that he would use it in a broad range of applications. I first got this knife around the same time I got the fire starter and have used it many times with cooking, shaving wood, fishing, and a bunch of other things. I have used over 3 dozen knives in my lifetime and this is one of my favorites out of all of them. It is super sharp, the rubber grip helps you keep a strong grip, and the sharpener works pretty well. It is so durable despite dropping it many times and stays sharp for a long time that it will probably last another 10 years or longer. Because it is reliable enough to be used in a variety of different ways, I would definitely recommend this knife. The only real issue I have with it is that the orange part does absorb dirt more, staining it often. For an emergency, this is a pretty decent tent. I bought it in case an unexpected storm ruined my camping tent during a trip which has happened once before and just in case a one-day hiking trip turned into a spontaneous over-nighter. It was a pretty decent the first time I used it, but it isn't as insulating as it advertises. I used it once when there was some rain and it did a great job keeping the inside dry. It is a nice reassurance to carry around in case something does happen to damage your tent or you need to hunker down for some unexpected weather. For that, it deserves a solid recommendation. On top of that, this product has turned out to be a perfect birthday gift for one of my friends, who was just jumping with joy to have such a cool thing! I have tried several emergency blankets in the past and found several cheap one-time users and other long-term favorites. This is for sure the later for me and many of my outdoor enthusiast friends. One thing that I like is that they are available in several colors: green, orange, purple, red, white, camo, and winter camo. My favorite is the camo and winter camo which is very convenient for hunters. The other issue that most of these blankets have are they too flimsy and easily destroyed, but these definitely do not fit into that category, unless you try to break them. Before I used the back-up tent, I actually used ones of these as a tarp to cover a hole that was in my tent and it worked perfectly. Do I recommend it? That is a solid yes. One of the few things I did not think I needed so much as wanted, I was a little reluctant to spend the amount of money that I did on this, but it has not let me down so far. It can be set up within seconds and just sit off in a sunny area to charge my phone and any other devices that I have that run off a USB charger. I absolutely love the peace of mind it brings when I think about getting lost and needing a map or a working phone. This charges my phone slower than my charger at home, but it is a nice source of power when you are in the wilderness. So, I give it a thumbs up for a recommendation. These flashlights are so bright that I have been able to continue hiking for hours after the sun has gone down until I have found a suitable camping spot. This is also one of the truly waterproof and durable flashlights out there. I dropped one of them in a stream and the other against a boulder and both worked fine, a few scratches here and there. Between the reliability and the affordability, I can't help but recommend this to all of you. In addition to the benefits this flashlight offers, it can serve as a universal gift that will cater almost to all tastes. Another self-sustaining solar product, I learned about this flashlight more recently, a little skeptical if it could work as well as it said. It does take a little bit to get a decent charge and the light has a more dimly lit blue color than white, but it works decently enough for a small amount of light and is small enough to be in a stuffed backpack without taking up too much room. It does a while to crank, too. This is another product that is recommended only for emergency use, mostly because of the fact that it is solar-powered. Otherwise, you are probably better off with a regular flashlight. Definitely one of the more unique solar items that I have seen, I was probably more skeptical about this product working than any other on this list. When I got it, I was very surprised at how big it was since I could fit one of my larger kitchen pots in it and still had some room. I used it for some stew and burgers and it actually cooked it all well through, although it can take much longer than using a kitchen or campfire. I would recommend it for those who are environmentally friendly and anyone who wants a spare cooker around for emergencies. Includes a 3-mode flashlight, and fire starter.